Are you looking for a good light which can provide you perfect illumination while you are doing house work, like sewing? Here is your ideal choice! What are you waiting for? Just come and buy! 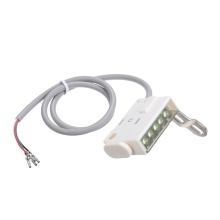 5v electric control case wire control, be easy to use and practical. Backstitch function for electric sewing machine, flexible to control. One simple side press button, easy operation. A good assistance for helping you does housework, like sewing, cleaning etc. 2. The red wire is positive wire and black wire is negative wire, the rest of wires are designed for backstitch electric sewing machine and the rest of wires do not distinguish positive wire from negative wire.